Gatsby, the ultimate dandy, would definitely be looking sharp if he were gracing us with his presence at the Esquire Magazine Man at his Best Awards 2013 in Dubai next month. A much anticipated evening in the Dubai social calendar, the awards recognise the achievements of men in the middle east, the invite promising a night of glamour with a Great Gatsby themed after party at the Conrad Hotel. With Esquire being a fashion conscious, style savvy magazine, we’re expecting to see some very suave outfits. However, taken too literally, the Gatsby Glamour dress code could result in some unforgivable fashion faux pas. Remember gentleman, this is a stylish and sophisticated Esquire evening with a Gatsby Glamour theme, and not fancy dress. For the film, Carey Mulligan’s costumes were designed by Prada and Miu Miu, with art deco jewellery specially created by Tiffany & Co. The Fitzgerald Suite at The Plaza Hotel in New York was decorated by designer Catherine Martin with restoration furniture pieces and original copies of the F. Scott Fitzgerald book. Leonardo DiCaprio’s clothes as Jay Gatsby were created by Brooks Brothers. For the ladies, a 1920’s inspired look is pretty easy to achieve at the moment – the fashion world has been bombarding us with feathers, fringes and flapper dresses for a while now. But what about the boys? Browse the Brooks Brothers Great Gatsby Collection for inspiration. If you have the chance to visit their flagship store, 346 Madison Ave, New York, take a look at the selection of clothes inspired by the film and the era itself. If you can’t manage a trip to New York, visit their website, not as much fun but it’ll have to do. Wear a dinner jacket. It seems obvious, but surprising is the amount of men who don’t dress appropriately for black tie. And remember, it’s an evening event. Yes, a Borsalino Panama and two-tone spectator shoes might be very Gatsby, but this isn’t summer in the Hamptons, old sport. Keep it classic. For a Gatsby look think well tailored, classic, preferably 3-piece, Jay Gatsby at the parties at his mansion. Don’t be afraid to opt for a navy or burgundy tuxedo. Add that 1920’s flair. A velvet jacket is guaranteed to give you that moneyed air. Ralph Lauren Purple Label has a white double-breasted version with a shawl collar which would look great with black trousers and monogrammed velvet slippers. If a velvet jacket is too much, try a velvet bow tie instead. Try a gauntlet cuff. Firstly, Tom Ford said it was alright for James Bond to do it, in midnight blue no less, so who are we mere mortals to argue. Secondly, although not exactly traditional on a tuxedo, it’s definitely very Gatsby. Don’t forget the details. Bow tie, silk pocket square, mother of pearl cufflinks and patent leather oxford shoes or velvet slippers really finish this look off. A stylish vintage pocket watch wouldn’t go amiss either. Evening dress scarf optional and only for the truly dapper. 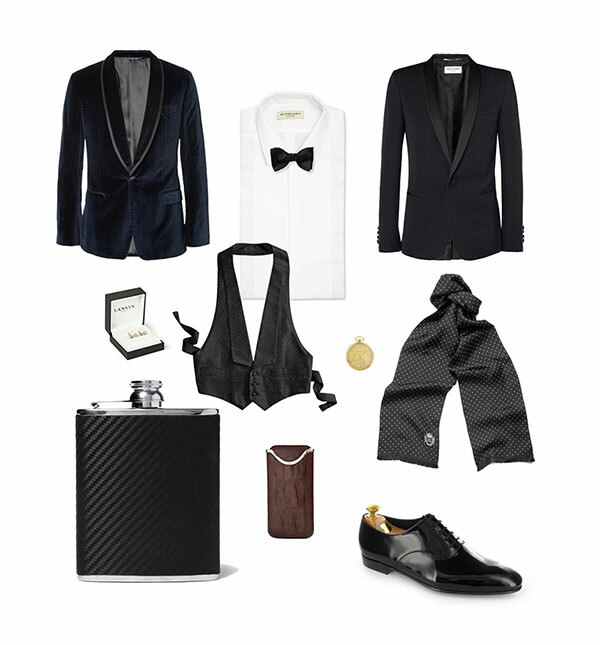 (From top left) Martini slim-fit printed velvet blazer, Dhs8,000, Dolce & Gabanna; classic silk-satin bow tie, Dhs420; trim-fit dress shirt, Dhs1,600, Burberry London; slim-fit wool tuxedo blazer, Dhs8,550, Saint Laurent; gold plated and mother-of-pearl cufflinks, Dhs1,020, Lavin; The Great Gatsby Collection backless vest, Dhs700, Brooks Brothers; yellow gold pocket watch circa 1920’s, Dhs20,000, IWC; swiss dot silk scarf, Dhs945, Dolce & Gabanna; chassis leather and stainless steel hip flask, Dhs810, Alfred Dunhill; crocodile leather and act gold cigar case circa 1926, POA, Asprey & Co; Cheam patent leather plain oxford, Dhs1,600, Crockett & Jones.